Is The Russian Blue Cat Good For You? Russian Blue cats have small upticks at the corners of their mouth that make them look like they are forever smiling. Russian Blues like to spend their time playing with toys or chasing beams of sunlight but they are not too hyperactive. You may find that your Russian Blue cat is missing when company calls, as they aren't fond of strangers. The only thing a Russian Blue cat dislikes more than a dirty litter box is when you are late to serve dinner. Also known as the Archangel cat, the Russian Blue was given this holy nickname because of their place of origin, the port of Arkhangelsk. Riding on boats with Russian sailors heading toward other parts of Europe, these cats first started cropping up around England and other countries in the later part of the 19th century. After the war, the Russian Blue was hurting in terms of numbers, and was bred with the British Shorthair and Siamese to help maintain their bluish grey coat and sleek frame. Today, they are popular in most parts of the world, and in no risk of going anywhere. 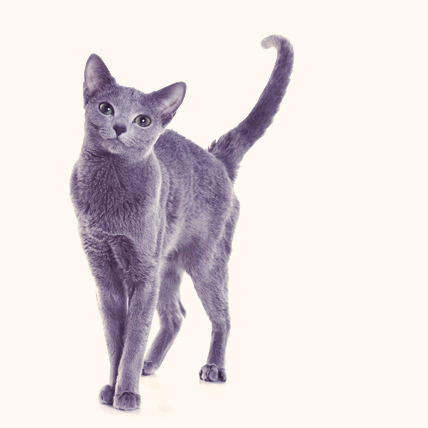 A elegant and understated breed, the Russian Blue gets by with just one color of fur (although it is a gorgeous one). Their smokey blue fur makes their emerald green eyes really pop. Their wedge shaped head gives them a regal look, and their muscular, lean body makes them look like they could be right at home in the lap of a princess or in a barn hunting down mice. Overall, a visually stunning breed. The Russian Blue is a smart, well-behaved, contemplative, and loyal breed. Often seen as shy around strangers, they are actually assessing the new people to determine whether they are worthy of their affection or not. 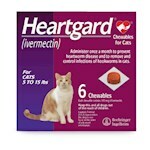 And they can be incredibly affectionate. They are one of the breeds smart enough to train their people, corralling them to get them food, or bringing them toys to play with them. Also, they are a very vocally expressive cat, in that they not only meow to get attention, but they have a wide meow-cabulary, using different tones and patterns to express different feelings. All in all, this is quite an interesting breed. The Russian Blue is always a version of bluish grey. The Russian Blue is usually a healthy breed, not prone to any specific illnesses or genetic problems.